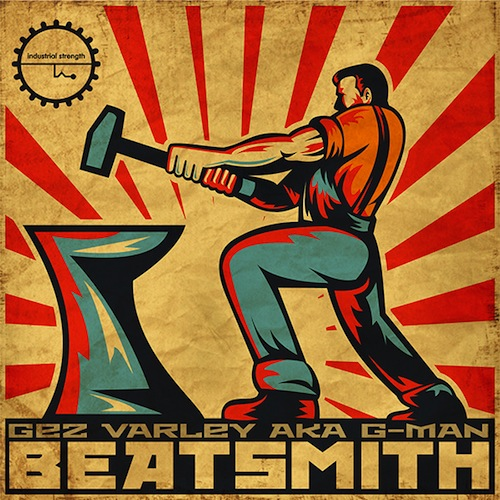 Legendary producer Gez Varley a.k.a. G-Man dives to the depths of Techno to surface with Beatsmith, a pristine collection of original sounds from Industrial Strength Samples. The one and only G-Man distills the essence of Techno in this immaculate arsenal of essentials and beyond. This tight set contains a slew of deep Effects, solid One Shots, primal Techno Drum Loops, eerie Music Loops and Textured Patches. Punctuated by searing Top Loops and Stabs, you’ll find twisted FX and Drum FX to make hairs stand on end, and rolling Bass to root your tracks firmly in the underground. Globally praised for his refined sensibilities as a DJ and producer, Gez Varley first came to prominence as half of the ground-breaking electronic duo LFO. The unstoppable team topped UK charts in 1990 with their first release and gained international acclaim, selling 150,000 copies worldwide. Forging ahead solo as G-Man, Varley recorded for labels including Warp, Force-inc, Gigolo, Swim, K7, White Noise, and +8. In collaboration, he’s stood next to the likes of Mark Bell, Richie Hawtin, Karl Bartos, Marco Carola, and Thomas P. Heckmann. His remixes have redefined the songs of Radiohead, YMO, Art of Noise, Afrika Bambaataa, Laurent Garner, Soft Ballet, Alan Wilder (Depeche Mode), AUX 88 and many others. Over the years, Varley has dedicated his ears to shaking the walls at the world’s top clubs, from Nature One Germany to Sonar Spain, Berghain Berlin, The Orbit in Leeds, Frankfurt’s Omen, NYC’s New Music Seminar, and Liquid Room Tokyo. His vast career spans more than two decades, during which Varley has sold more than 500,000 records. His music has appeared in compilations, computer games, and commercials, and now ISR is thrilled to bring these signature sounds to your Daw. G-Man pulled out all the stops to produce Beatsmith with the sweetest analog gear and finest attention to detail. These samples are primed to skyrocket any Techno, Minimal, and Electronic music track. 24-bit Wav files are flawlessly formatted for Apple Loops and ready to move in NI Battery 4 and NI Maschine.